This jar of free range Pickled Eggs With Horseradish was sent to me especially by the Purely Pickled Eggs company. They may have read that I have a love of most things pickled, especially pickled eggs. Pickled eggs usually go fantastically well with fish and chips from the local chippy. However, horseradish is a fantastic accompaniment to beef. So I immediately had a quandary. Should I try the first of these pickled eggs with fish and chips or on the side with a juicy beef sandwich? I just simply couldn't decide, so I thought I'd try the first egg on its own and enjoy the rest of the jar at my leisure with both meals. I felt a little odd giving the jar a quick sniff on opening. I usually sniff beer, but I couldn't help my curiosity. There was indeed a hint of horseradish in amongst the wine and malt vinegar odour. There were peppercorns and squared chopped pieces of horseradish dancing around in the bottom of the jar. A pulled the top slightly discoloured egg out of the jar with a metal fork and for some reason beyond my self control gave that a sniff as well. The strength of horseradish and mixed vinegars tickled my nose hairs. I began to salivate. I took a big bite out of the pickled egg taking care not to break teeth on the metal fork. Safety first here at Foodstufffinds of course. The horseradish, pepper and vinegars had mixed well together forming an overall spicy flavoured pickled egg that was dominated by horseradish, with a mild pepper kick that lead to the vinegars and a final polish of lemon. I found these Pickled Eggs With Horseradish lip-smacking. It was difficult to stop licking my lips after eating one. I wanted another straight away, but realised my next tasting was Pickled Eggs with Spicy Vinegar, so will have to look forward my beef sandwich meal! Weight: 360g full and 165g drained. Suitable for vegetarians. Ingredients; egg (would be a bit surprised if there weren't any), wine vinegar (with sulphites), malt vinegar (with barley), horseradish, spices (peppercorns), and lemon juice. I picked up this jar in a garden centre farm shop, which is one of Cinabar's favourite haunts. I was quite taken aback by the amount of spicy and herby ingredients. Cinnamon and ginger certainly complement apple, but I was unsure how cloves, coriander and garlic would taste with the cyder vinegar and eggs. On opening the jar I gave it involuntary sniff. There was a dominant smell of allspice and cinnamon mixed with the cyder and malt vinegars. There was a mix of ingredients dancing around the bottom of this jar. I pulled the first slightly discoloured pickled egg out of the jar with a clean metal fork giving it a now customary sniff. There was a mix of warming allspice and cloves dominated by a citrusy coriander odour from the egg. on first bite there was an initial complexity of the burst of spicy and herby flavours that took my breath away and all followed by a vinegary cyder apple aftertaste. This was a lovely complex mix of flavours starting with warming winter spices of allspice, cinnamon and cloves blending into an early Spring coriander and garlic, then a heat from the mustard and pepper followed by cider apple and vinegar. These sumptuous Pickled Eggs with Spicy Vinegar would more than complement a roast pork or ham sandwich lunch with a decent wedge of Cheddar cheese on the side. Other pickled egg flavours in the range (get it?) are Chilli, Beetroot, Fruity Balsamic and also Garlic. I'll certainly be looking out for them. Weight: 360g full and 165g drained. Suitable for vegetarians. Ingredients; egg, cyder vinegar (38%), malt vinegar (with barley), spices (allspice, coriander, mace, peppercorns, mustard, cinnamon bark, chilli, cloves), ginger, and garlic. 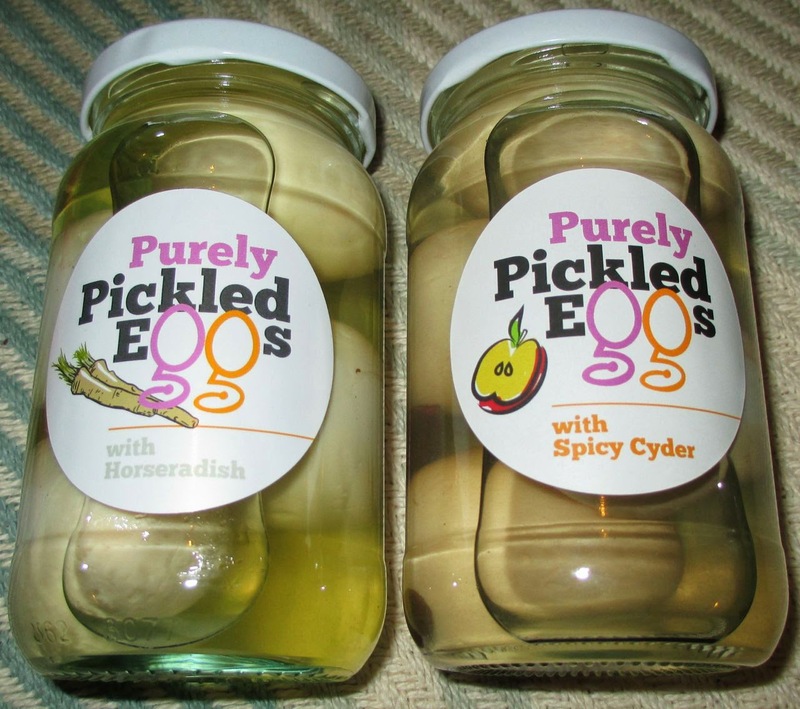 If you'd like to purchase a jar of Purely Pickled Eggs please visit www.purelypickeledeggs.co.uk or tweet us @purelypickledeg. Thank you for the brilliant review!